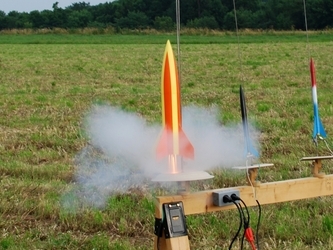 This year I have four boys doing the rocketry project; as only one of them is actually doing it as a 4-H project, I'm not calling this a 4-H launch this time around. Scheduling conflicts prevented us from getting in any earlier launches, but that's fine... the weather was beautiful today, mid 80's and very little wind. Dry, windy weather made it appear that we might have trouble setting up a launch for the 4-H project kids this year, but then suddenly after a brief spate of rain I saw that the forecast for Saturday the 9th was nearly windless. A quick flurry of Facebook messages later, and four of the five project kids (and their mothers and some of their siblings) were lined up to launch. 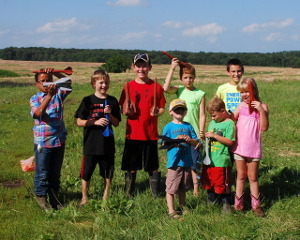 A couple of the boys from this year's project group asked me to help them finish painting their rockets, and I arranged to visit them on a farm near Kahoka, Missouri to do just that. But as I looked at the weather forecast and saw mid 70's and almost no wind, I knew we had to do more than prime and sand rockets. I've been hoping for a good chance for a launch all year. Last week I watched the forecasts for Sunday the 20th with anticipation; by Friday it seemed obvious we would have just the right sort of day for a launch, and the field I usually launch in was freshly mowed and baled, so I notified the parents of the 4-H kids I led this year; of the seven kids I had in the project, three were able to make it. Add to that Joe Coehlo, a member of the Canton Camera Club (as are my wife and I) and another friend, Tim McAfee, who had never been to a launch before. I'd call the turnout excellent. All the rain we've been having has made planning a launch for the 4-H kids a bit hard, but looking at the forecast last Friday it became clear that we might be able to launch on Sunday. A flurry of Facebook messages later, we had planned to meet at a field near one family's residence. 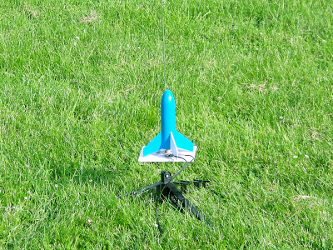 The field had wet spots and a few inconvenient trees, and it was hot, but all in all the launch went pretty well. 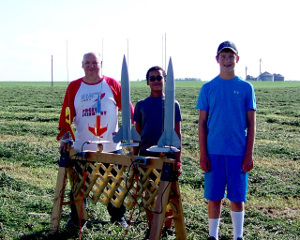 Note: Though this was officially a 4-H launch, not all of the kids who flew were 4-H members. Just in case anyone wonders. Wow, almost a year since my last launch. My wife and daughter are working tonight at the county fair, and I was going to be there too, watching the motocross races; but the almost incessant rains (including an installment yesterday) made the dirt in the arena too soggy to build a track on it. 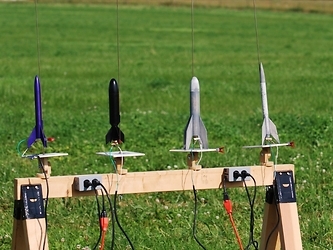 I was getting desperate to launch some rockets... if you look back through my launch reports, you'll see why. It's been a while. So when I got home from work today and the conditions were perfect, I just had to head out to the back yard and launch a few. Tonight was the science club "event" at my daughter Taylor's high school. It's not a science fair... there's no competition or judging. Instead, it's a show for the younger (elementary school) kids, to try to give them an interest in science. The wind has blown and blown this year. Finding opportunities to launch rockets hasn't been easy. 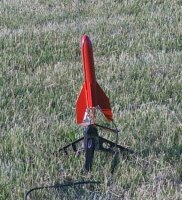 So when I found the weather darn near optimal for rocketry, I had to fly some. 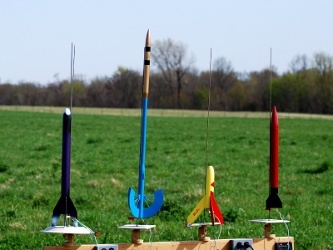 I laid out and prepped nine rockets and was all ready to head over to the local farm where I launch. After a week of really sweltering weather, things cooled off somewhat today. I walked out into the late afternoon sunshine, noted the wind had laid, and realized that I could launch a few. My daughter Taylor had a couple of friends over, and they helped with the launch and recovery. My brother Greg is back for the 4th of July holiday, and he brought my other brother Adam's kids with him. 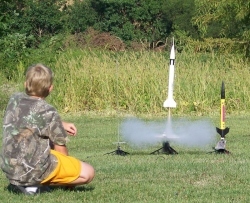 I knew that my nephew Jesse had shown an interest in rocketry before, so we planned a launch for today, Sunday the 3rd. I prepared sixteen rockets, thirteen of mine plus three of Taylor's; however, the wind, which had been pretty calm, picked up somewhat, and between that and the fact that I couldn't use the first position on my stand (owing to the rod nut coming loose), we flew only nine. 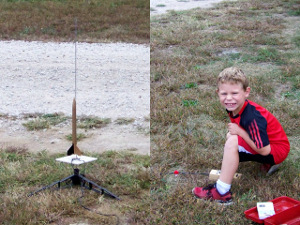 The weather hasn't been very conducive to rocket launching lately, but we needed to get the 4-H launch done before the Fair. So, when we saw that Father's Day was predicted to be nice, we decided to have the launch at 5:00pm. The wind was light, perhaps 5-10 MPH and coming from the east; we did have some drifting problems as a result of that. 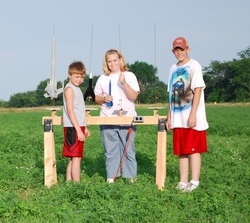 I had two new 4-H Aerospace members over working on their rockets, along with Jaclyn, who is in her third (or is it fourth?) year in the project. 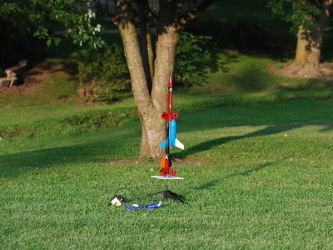 As I watched the boys putting primer on their rockets, I thought about what a boring task sanding and re-priming is... and I decided we would launch a few in the back yard, just to keep their interest up. Justin's school had a science-related event, which sadly I don't know the name of, and he came to me and asked if he could borrow my launch stand and controller to have a public launch. 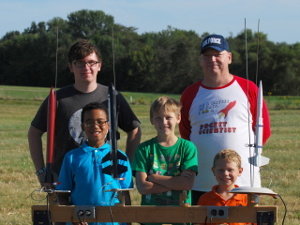 I was unable to attend due to work, but I sent him off with the equipment he requested, four rockets (a couple of his own, a used Estes RTF I got from a school, and my Triskelion), 12 engines, and my long range box (where I keep my regular launch rods). 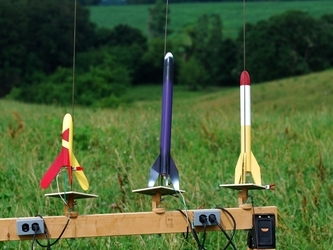 It just hasn't been a good year for rocket launching in Northeast Missouri. Today was my first real opportunity... it was fortunate that I was able to get off work early. The wind was moderate but variable, probably topping out at 10 MPH. Though Justin and Jaclyn, my 4-H rocketeers for the last several years, were unavailable, my wife Tracy and daughter Taylor accompanied me. I've been itching to launch a few more rockets, and tonight was just beautiful. I knew I'd only have about an hour of daylight to launch in, but fortunately I had prepared a few low-fliers (including my Lo Flier) in advance. Tracy took the pictures, as usual, and Taylor and her friend Jaclyn assisted with the recovery. Two weeks ago, the landowner who owns my current favorite launch field told me he had it mowed and baled, and that I should feel free to come over and launch anytime. Of course, the wind refused to cooperate... from then until today, we only had one day when the wind was calm enough to launch, and it was a weekday when I had to work late. Until today, I said. This morning I looked out and saw that there was no wind. None. It's almost axiomatic that you don't prepare rockets to launch around here when the wind is calm, because by the time you're ready, it's windy. Undaunted, or perhaps just stupid, I soldiered on, and by 11:00am we were ready... and the wind was light and variable, mostly from the southeast. Ideal. 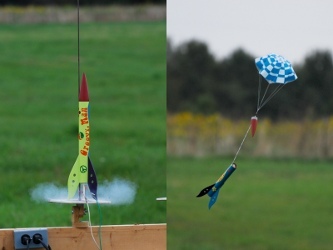 The weather forecast said that the next week would be unsuitable for launching; so, despite 12-20 mph breezes and a cloudy sky, I decided it was time for our 4-H club launch. This year, Sam wasn't able to participate, so the group consisted of Jaclyn and Justin. My daughter Taylor and I also launched some rockets. For about the first time this year, launching conditions were perfect this afternoon. So, I launched a few in the back yard with Taylor (my daughter) pushing the button and helping to retrieve them. Sorry, no pictures this time. Once again, I joined the SPARC guys in St. Peters, Missouri for their regular monthly launch. They were launching at the soccer field this time, so we drew some spectators, which was pretty cool. The wind quieted somewhat suddenly Sunday evening, and my thoughts turned naturally to rockets. Four kids (my daughter and three neighbor boys) were in the yard, so I got four low fliers together along with my handmade controller and my modified Estes stand, and headed out to the back yard. 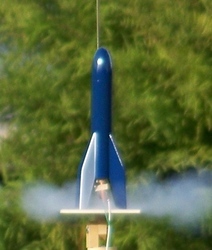 My first launch of the year happened to be our 4-H club launch. I had three project members present: Sam, Jaclyn, and Justin. It's Justin's third year doing 4-H Aerospace, but the first for Jaclyn and Sam. Some time back (like, last year), Troy (akpilot) issued an open invitation to me to attend one of his club's launches. I finally got the chance yesterday. The weather this morning was beautiful, and the weather forecast was for more of the same all day long. Partly cloudy, temperature in the 70's and 5-10MPH breezes all day. I knew better than to believe that last... I've learned that, in Missouri, you prep your rockets when there is a breeze, and often there will be none when you start to actually launch; but start prepping when there is no breeze, and a stiff one will blow up on you. But this is a good thing, I thought, as I wandered out into the light breeze. 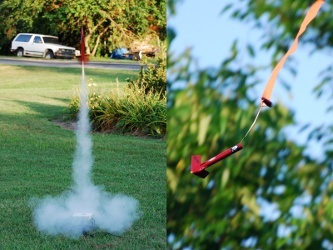 My daughter Taylor and I launched a very few rockets in the back yard tonight, starting around 7:30pm; thus, we had about half an hour of useful daylight left. Mainly, I wanted to test my new miniature X-24 Bug (3/4 scale, 13mm power, all paper except for the bulkhead) and try out my over 20 year old Centuri Flying Saucer. I also launched Taylor's Gauchito. Rather than dragging out the four-way stand, I used an Estes stand (modded with a ceramic tile launch deflector) and my wooden launch controller. It was about 85°F and apparently windless. After waiting seemingly forever for (a) decent weather and (b) all the hay and wheat to be mowed, we finally got our chance. Taylor, Justin, Jaclyn, and I all got in some launches, and for the most part we were very satisfied. All of my rockets which got launched had never been launched before. 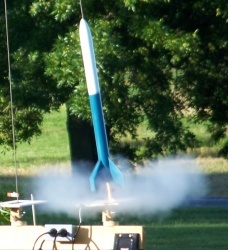 Finally, after a long string of weather-related setbacks, conditions became right for a launch. 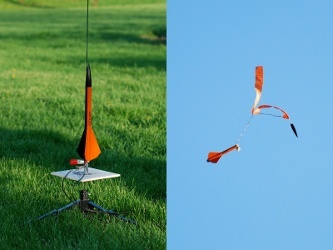 We had a beautiful sunny afternoon for launching, 85°F with moderate humidity and virtually no wind. Justin, Taylor, and I launched several rockets, with only one mishap. This afternoon was cloudy but fairly calm, with breezes of around 5 MPH or so. 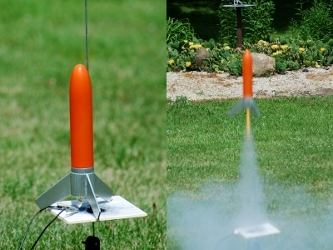 Justin and I decided to launch a few of our rockets, including some of mine that had never been launched as well as a few that hadn't been up recently. In honor of the impending birthday of the son of my wife's best friend, we held a launch July 1st. Jeffrey (the birthday boy), his sister Megan, my protege Justin, his sister Jaclyn, my daughter Taylor, and I all launched rockets. 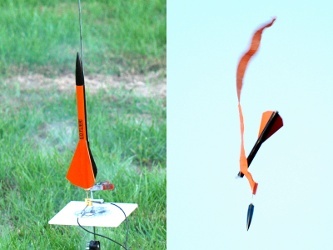 Taylor, Justin, and I got in a really good launch this evening, starting at around 6:40pm. The air temperature was in the mid-70's, with very light winds. 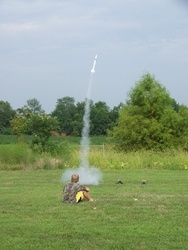 Taylor (my daughter), Justin ( the neighbor kid I've been teaching about rocketry) and I launched several times today. 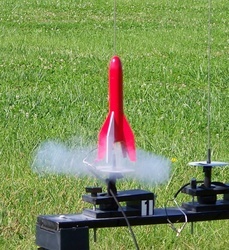 Yesterday was the first day that would have been fit for rocketry, but I had other commitments, so today was the day. 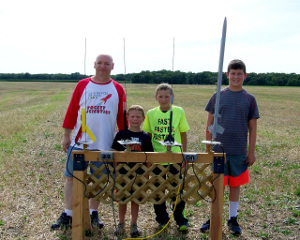 I launched a few with my daughter and my neighbor's son on Sunday the 8th. The neighbors are blessed with a large, tree-less back yard; my yard is big but has a bunch of trees.